Parents influence their kids, their friends, other parents, other parents’ kids. What parents do or don’t do in literature impacts readers, too. From entertaining to self-sacrificing, overbearing to absent, parent figures in literature can change your view of the story, and maybe even your view of parenting! In this month’s Reader’s Write, we asked: Which literary parent figure is most compelling to you, and why? Paige: Atticus Finch (Harper Lee’s To Kill a Mockingbird) is, and always will be, the greatest literary single father/hero of all time. As a defendant by profession, Atticus successfully changes the hearts and minds of not only his own children, to whom he is both mother and father might I add, but also his entire town, hell bent on scapegoating an African American man for a white man’s crime. Atticus goes the extra mile, basically sacrificing himself for the unbelieved and unloved, much like Jesus Christ. Other than that, he is charming, intelligent, and has always emulated the type of man I would like to father my children some day. I say Atticus Finch for the win. Jennifer: I always found Mr. Bennet to be a self-absorbed parent who would probably have been diagnosed with depression in modern times. If he had spent more time with his daughters, rather than hiding from his family in his library, he could have seen where things were going and saved the whole family a lot of grief. I also never liked the way he made fun of some of his daughters in front of others and had obvious favorites. I think he loved his wife, but knew that she was a stupid woman, and, knowing this, should not have allowed her to have complete charge of his daughters (half of whom were just as stupid). I guess it’s funny how different people see characters differently! I think Atticus Finch in To Kill A Mockingbird was a great literary parent figure because he taught his children what it means to do right, even when it is more popular to do what everyone else is doing at the time. Lisa: Scarlet O’Hara (Margaret Mitchell’s Gone With the Wind) could be looked at both ways. In some respects, she was too selfish to be a good parent and probably wouldn’t have had her children if she could’ve helped it. At the same time, she was selfless enough to make sure she and her family survived everything, at any cost. 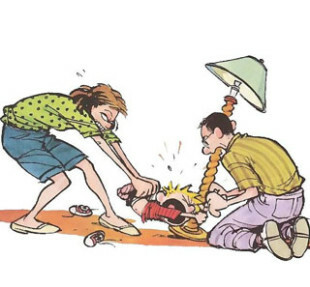 Tim: Calvin’s parents from Calvin and Hobbes (Bill Watterson). So many life lessons. Like, “Being miserable builds character.” For one, they’re hilarious. Two, they’re such a great image of what parents seem like to a little kid. They’re out to make his life miserable and have no fun. But they have their own sense of humor that comes out in their sarcastic responses. You can also tell how much they love him. When Calvin loses Hobbes, they go to great lengths to help find him. Megan: Marmee March in Little Women (Louisa May Alcott). Perfect example of womanhood and a godly wife of that time. Proper, yet sassy. Fiercely devoted to her daughters and committed to her husband. Diligent and thrifty in running a household, and not letting her daughters suffer undue depravation—of a bodily or emotional sort. Wise and kind and constant. Of course, this is easy to create in literature, but I am nonetheless admiring of and compelled by her character. She’s my literary role model. Sarah: Marilla and Matthew Cuthbert from Anne of Green Gables (Lucy Maud Montgomery). The movie was all about Anne’s relationship with Gilbert, but the book was really about Anne’s relationship with Marilla. Marilla was thrown into the role of motherhood without her consent. Sure, she consented to have Anne live with them, but she never really wanted to raise or love her. But through time, mishaps, adventures, seeing the world through Anne’s eyes, and the example of her brother Matthew (who never wavered in his love for Anne), Marilla learned to be an amazing “mom” (even though she never allowed anyone to call her that). Anne softened Marilla and Marilla showed Anne what real love was. It wasn’t the romantic, poetic love of all her fantasies. It was a steadfast, hard working, disciplining, sacrificing type of love that consumed Marillla’s heart (in time). Matthew was another amazing parent. He doted on Anne, in a way she had never experienced. This unconditional love did not save her from making mistakes, but she always knew she could come back after making those mistakes, without shame or fear. The later Anne books became a little too hokey for me, but the first one is amazing. Logan: Ma (Caroline) and Pa (Charles) Ingalls from Laura Ingalls Wilder’s Little House on the Prairie! I loved reading those books as a kid, loved reading them to my grandma and talking about the Ingalls family’s adventures and values. My family watched the show on TV, and we all read the books. Now I love reading the books to my kids. Laura’s parents were a great mix of love, patience, discipline, faith, compassion…all the qualities kids need. And it’s cool that their story is written by their own daughter! That tells you right there how compelling they were and the influence they had on their family. Josiah: I’d like to see more compelling parents in modern-day middle grade and young adult novels. It seems like in order to allow the protagonists room to grow into themselves, the authors take out the parents. There’s always a dead mom or dad in the beginning, or a step-parent who’s portrayed as evil. As a parent (and stepdad) myself, I like to think we do a lot to help our kids (and stepkids) and teens find their own path to greatness and become everyday heroes, even when we are very much alive and present. I’d love other readers to point out some of today’s modern popular books they’ve found that have compelling parent characters. I want my kids to read those books! We’d love to hear more about the parents or parent-like characters who’ve made your favorite stories so memorable. Have a suggestion for Josiah? Add your comments below. What do you think about how mothers or fathers are portrayed in books? What is missing in fictional parent-child relationships? Do you think literary portrayals affect how society views parenting roles? What about stepparents, grandparents, mentors, cool uncles, watchful neighbors, and other parent-like characters? What compelling character would you love to read about to your parents? Feature image: Calvin and Hobbes courtesy of Bill Watterson. Sorry, but Mr. Bennet was a bad parent and realized it at the end. I don’t think there’s any evidence that he loved his wife;love in marriage is a modern idea. Yes, he loved and cherished Elizabeth and wanted her to marry someone she could love. That came out of his experience. Yet he was unfair to his daughters and pretty much ignored them. He didn’t allow them to make choices, but just laughed at them. He is likeable and fun, but a bad parent. Mrs. Bennet is foolish and dramatic, but at least she is concerned about the future of her daughters, although she goes about it wrong. Again, Mr. Bennet could have controlled her, but didn’t bother.